More Durability and a Higher Melting Point compared to Platinum, better center electrode anti-oxidation and anti-erosion, improved ignition, superior anti-fouling, lower required voltage, new metal shell plating process for better anti-corrosion. One Step Colder plugs are reccomended for cars with heavy modifications. These NGK plugs will get your Turbo Subaru running smoother and free up some power through increased efficiency and increased heat resistance. These are available in stock heat or one step colder for cars running approximately 100 horsepower more than stock. 1. 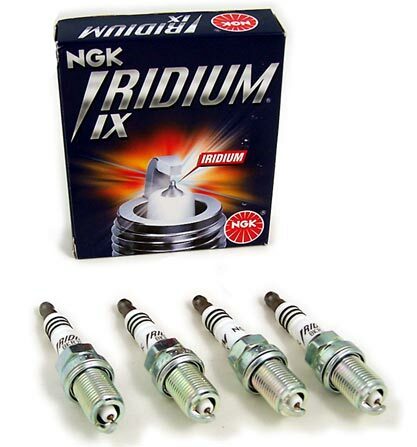 Iridium plugs are able to use larger gap setting with less voltage. Some customers choose to regap these plugs to correct misfiring or tune for optimal spark -- do so at your own risk -- slide-type plug gapper will damage the fragile iridium tip. 2. price is for a set of 4 spark plugs. Click the button below to add the NGK Iridium Spark Plugs suit Subaru WRX/STI 2.0litre to your wish list.